*Andy enjoyed this flick in good company. Perhaps that's why I'm laughing instead of being scared. Neh... I don't think so. Vacancy works by being unbelievably entertaining rather than entertaining by being believably real. I think it bogs down to your level of threshold for “thrill”, “scare” and “experience” for this one. So then the two quarrelsome duos will discover in their creepy “Honeymoon Suite” that a collection of videos featuring gruesome images of violent murder are filmed exactly where they are. I bet you’ll be freaked out too. The scare in Vacancy is how director Nimród Antal uses the textbook stuff of leaving spaces in between scenes for your imagination to enter. Literally that is what the word “Vacancy” means, a vacant spot for you to fill in. The scene where the mechanic played by Ethan Embry saying to the couple, “I should pay you for giving me something to do,” tells it best. The idle mind really is the devil’s workshop. As I’ve mentioned earlier, how much this movie works is largely dependant on your threshold for “thrill”, “scare” and “experience”. 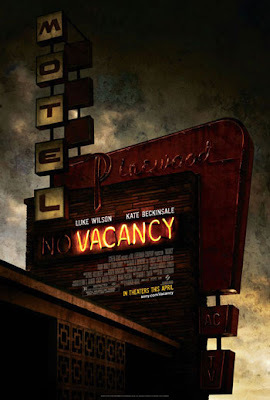 There’s nothing gruesome in Vacancy, just a simple game of cat and mouse played within an isolated vicinity of a creepy motel.